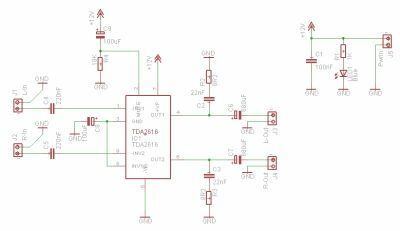 Stereo Audio Amplifier with a TDA2616 | Enide! 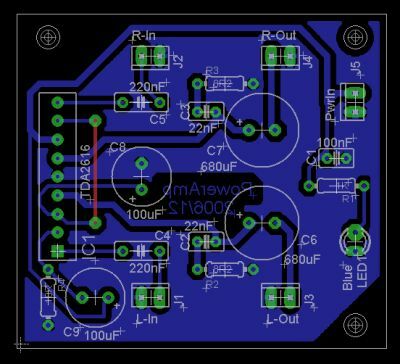 In 2006 I decided that it was time to build a real audio power amplifier, based on an integrated circuit to reduce the number of external components and cost. 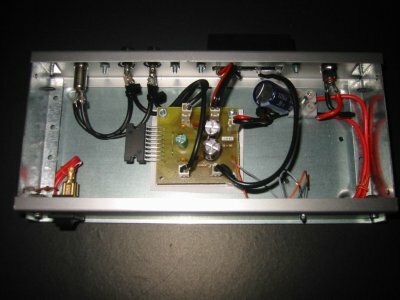 I built my first power amplifier when I was still in secondary school. The circuit was made of transistors, didn't provide much power, audio quality and had an ugly PCB. 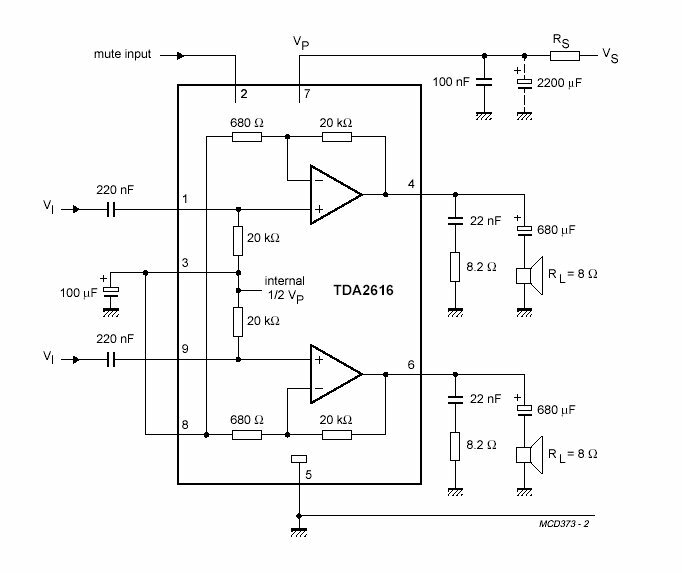 After browsing the NXP(external link) website for audio amplifiers I chose the TDA2616/N1, a 2x12W stereo amplifier that can be powered from a single supply voltage. The single supply voltage simplifies the power supply design and allows the use of pre-built units. 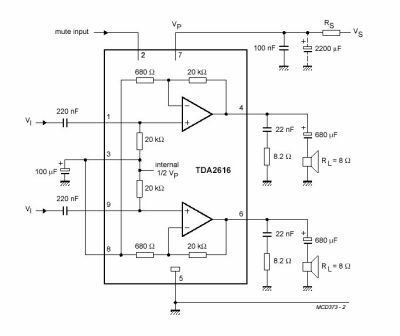 The entire amplification circuit is based on the single supply voltage example, provided in the datasheet. 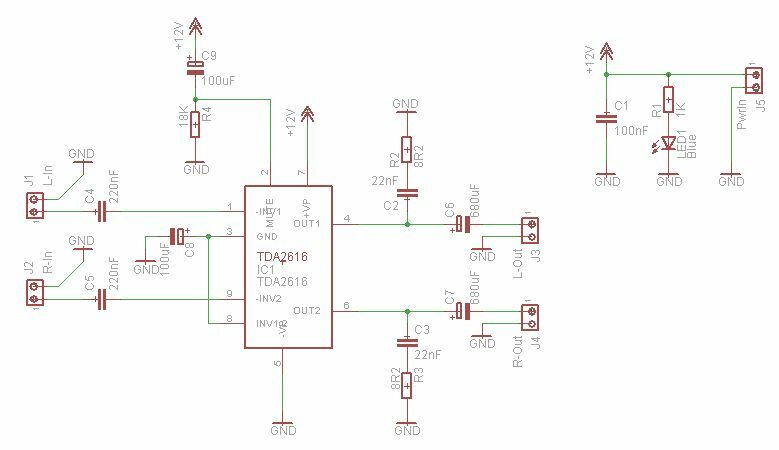 An adicional power-on mute circuit built around a relay is being tested to be included as an extra and prevent startup noise in the speakers. This is the original circuit from the datasheet. This is my version designed in eagle. The stereo signal is fed to the amplifier pins 1 and 9 by the two 220nF capacitors that remove any DC component that it may have. Internally both signals are summed to half of the supply voltage. This voltage is available at pin 3 and is stabilized by the 100uF capacitor. 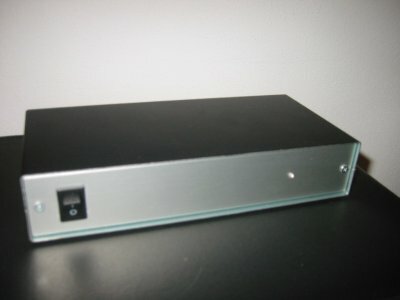 The gain is fixed internally to 30dB. The signal exits the amplifier at pins 4 and six and is sent to the speakers. 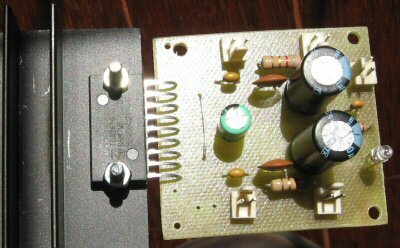 The printed circuit board is single sided and needs 1 wire jumper. The amplifier is great! I used shielded cables to carry the signals from the panel connectors to the PCB and there is no noticeable noise. 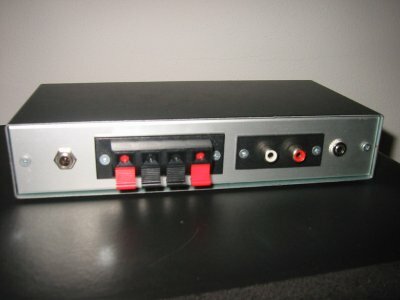 The output connectors use regular cables to carry the current to the speakers. The mute circuit is not yet included in this box because it was not ready at the time.